Not only do we raise large, immediately recognizable objects from QAR such as cannons and anchors, but we are also constantly on the search for minute remnants of shipboard life. While many small artifacts are found in concretion, others can be found loose in the sediment. 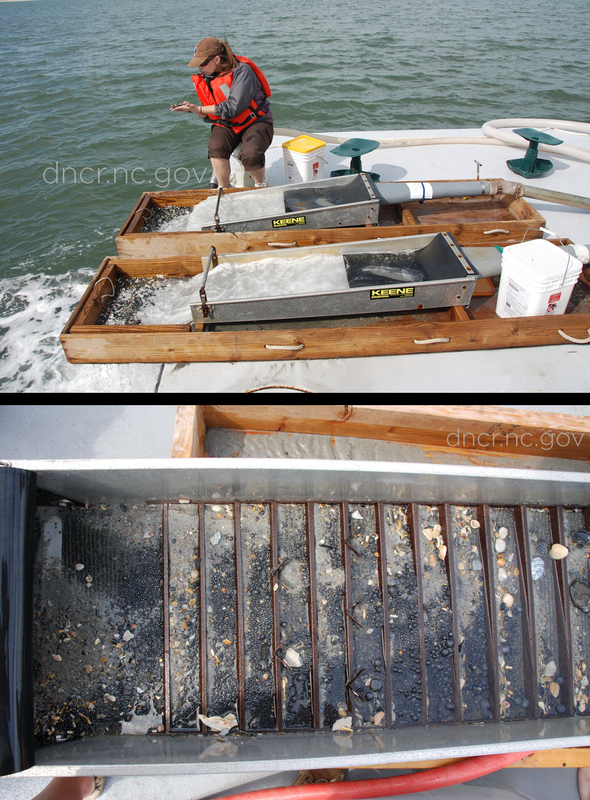 The search for the latter involves using water-induction dredges to collect sediment for further investigation topside. The dredges act as a vacuum, pumping water and sediment from a single five-foot by five-foot square, called an excavation unit, up to the deck of the dive barge. This material, referred to as dredge spoil, passes through a sluice which causes the heavy sand and artifacts to settle into the baffles in the sluice box, while most of the lighter sand and shells are washed away. We rely on dredges to aide in finding tiny artifacts which poor visibility prevents us from seeing in situ. This method ensures that even the smallest bit of archaeological evidence is collected. Once an excavation unit is complete, the dredge spoil is transferred to a bucket labelled with the unit number, so we know exactly to which unit artifacts should be attributed. 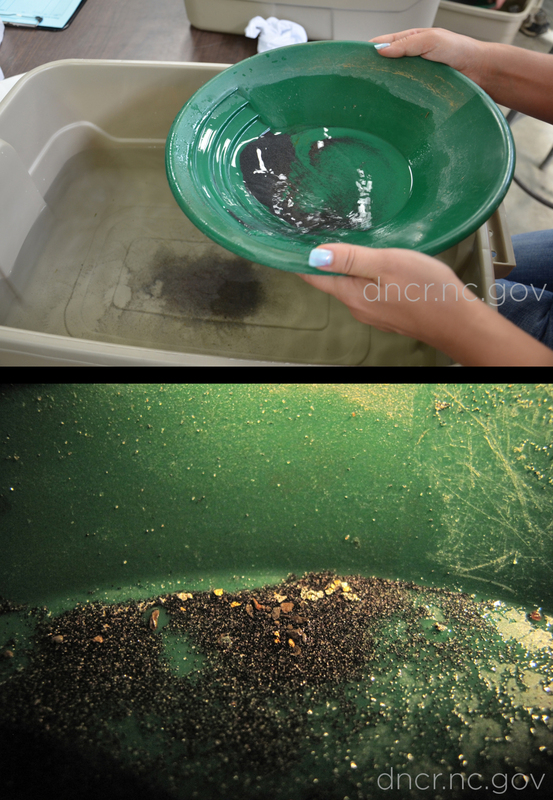 The buckets are transported to the lab where sediment undergoes several stages of careful scrutiny. The first step in the process is to pass sediment through two graduated sizes of sieves. With a screen size of 4 mm, the large sieve catches artifacts such as ballast cobbles, larger caliber lead shot, and wood and glass fragments. 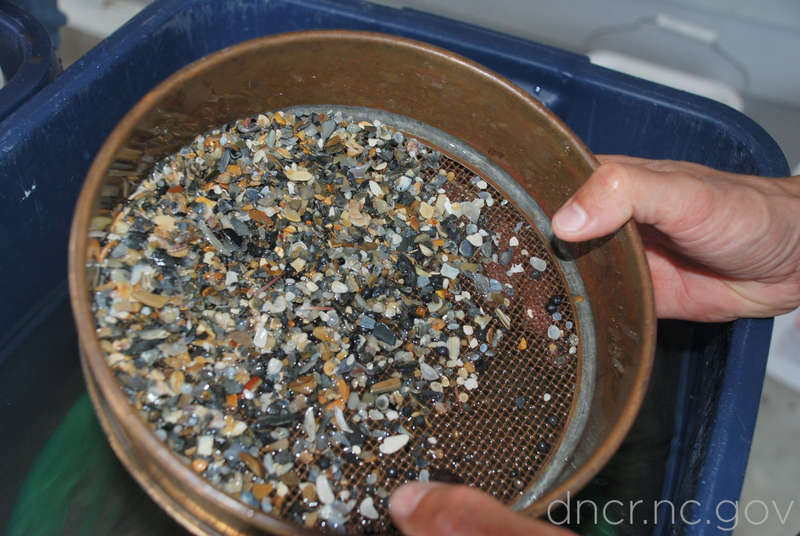 The large sieve also allows us to capture and separate shells from the cultural material. The small 1.4 mm sieve is where much of the smaller Rupert shot is found, along with copper alloy sewing pins and glass beads. The small sieve is also usually coated with a layer of broken shell hash, which is carefully explored for hidden artifacts before being discarded. Artifacts are grouped together based on material and assigned new numbers, with each group being weighed, counted, measured, and photographed. The records are entered into the database, and artifacts are ready for storage or conservation. The discarded sand and shell is returned to site. What remains following sieving is sand and the finest broken shell. This is panned to remove the lighter debris, leaving only heavy black sand in the pan. The final step is the most time-consuming part of sediment processing. Black sand is explored grain by grain under a microscope in search of the smallest artifacts in the QAR assemblage: grains of gold. In a blog to come, the significance of the gold grains as artifacts will be discussed. Stay tuned! -Sluices on deck of barge. Courtesy NC Department of Natural and Cultural Resources. -Sluice filled with lead shot. Courtesy NC Department of Natural and Cultural Resources. -Smaller sieve with lead shot. Courtesy NC Department of Natural and Cultural Resources. -Panning black sand. Courtesy NC Department of Natural and Cultural Resources. -Gold and black sand under microscope. NC Department of Natural and Cultural Resources.